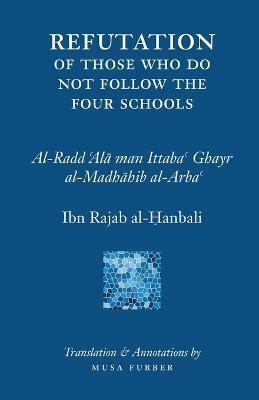 Ibn Rajab's essay Refutation of Those Who Do Not Follow the Four Schools advocates for the necessity of following Islamic scholarship in general, and legal scholarship in particular. A large portion of the essay covers the history of the development of Islamic scholarship and how the Muslim Community came to recognize scholars as the source for authoritative knowledge. Readers of the essay will notice that Ibn Rajab is engaging individuals who saw themselves as equal or superior to prior generations of scholars, free to cast aside scholarship and to reinterpret without any need for requisite skills and knowledge. Although written seven centuries ago, it might as well have written with today's reformers in mind.